"Can you believe the holiday season is upon us? Scrambling for a last minute holiday gift? It seems as if it was just January when I vowed to start my Christmas projects early. Yikes, how time flies! Given the time parameters between now and the holidays, I decided to create some red work patterns for all of us to enjoy stitching. 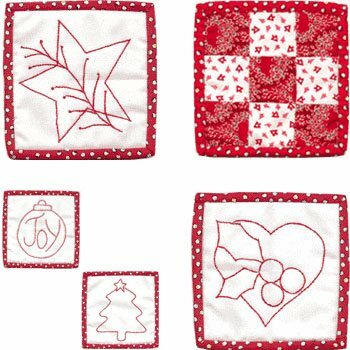 These little patterns can be used for greeting card inserts, tree ornaments or given as a group of coaster sets. It seems as if red work has taken the quilting community by storm and I know why. It is the perfect take-along project for people on the go. Did you know that a stoplight can provide three minutes of stitching time? Whether this season finds you contentedly finished with all your holiday projects, or in the panic mode as I find my self, take the time to enjoy the simplicity of red work!"